Mr. Vanstone’s daughters are Nobody’s Children, and the law leaves them helpless at their uncle’s mercy. With these words, the lawyer handling the estate of Mr. Andrew Vanstone sums up the situation faced by Norah and Magdalen Vanstone, and this novel, which started out looking like a domestic comedy, becomes a story of intrigues and scandal—it becomes a Wilkie Collins novel. In her review last year, Jenny described the plot in some detail, so I’m going to refrain from that here. Do go read her review if you’re interested in how the story unfolds. The novel is full of plot—of plots, in fact, as younger sister Magdalen Vanstone tries every trick she can think of to win back the fortune she and her sister lost when their father died. Readers frequently remark on the characterization of the women in Wilkie Collins’s novel. Most notable for many are Marian Holcombe of The Woman in White, who goes toe-to-toe with the dastardly Count Fosco, and Lydia Gwilt, the unapologetic villainess whose schemes fill the pages of Armadale. Magdalen is every bit the schemer that Miss Gwilt is, but Magdalen has a conscience, and she has a sister who is affected by her actions. She cannot fully give in to her drive for justice without destroying herself. The fascinating thing about this novel is its treatment of Magdalen. The narrative simultaneously supports and condemns her actions. Most of the novel focuses on Magdalen, with a third-person narrator telling her story as it happens, guiding readers to root for her. Her adversaries are described in such as way that we cannot possibly root for them. There’s Mrs. Lecount, a foreign woman obsessed with reptiles and suspicious of Magdalen from the start. She keeps house for the weak and effeminate Noel Vanstone, who now possesses the inheritance that would have come to Magdalen and Norah and staunchly refuses to assist them in their impecunious situation. In contrast, Magdalen is beautiful and clever—and she has of course been unjustly robbed of her inheritance and is only seeking to right that wrong. Who could blame her for that? But in our sympathies for Magdalen, we forget that her inheritance was only as large as it was because of an injustice done in the previous generation. In fact, the man who inherited Andrew Vanstone’s estate saw his new fortune as a Providential righting of a previous wrong. If justice is to be a guide to right action, who’s to say what’s just? What wrong have Magdalen’s adversaries actually done, as unlikable as they may be? If we consider Mrs. Lecount apart from her role in keeping Magdalen from her money, she could be said to have many good features. She’s loyal to her employer, devoted to the memory of her husband, filled with scientific curiosity, extremely sharp and observant, and ready to run to her brother’s bedside when he falls ill. Her only wrong is that she’s keeping Magdalen from her fortune. Yet the narrative pushes us to dislike her because she’s a threat to Magdalen’s plot. The way Collins manipulates our sympathies is quite ingenious here. Further complicating our feelings are the letters that the characters exchange “between the scenes.” Here, we see others reacting to what Magdalen has been doing. We find out how worried her sister is—and we see how Magdalen’s behavior put Norah at risk. That certainly gave me pause, especially when Magdalen refused to listen to the concerns raised by others who cared about her. She was ready to give up her family and all her friends in the name of justice. This certainly isn’t right. But some of the reasons people turn against Magdalen are ridiculous. At times, it appears that merely being a woman who looks out her herself makes her an object of suspicion. Early in the novel, when Magdalen seems intent on understanding the details of her legal situation, her governess, Miss Garth, fears that there’s a defect in her character that will get her in trouble. It turns out Miss Garth was right to be afraid, but treat strength and calm in the face of turmoil as a sign of poor character seems … wrong. So again, I’m back to sympathizing with Magdalen and wondering what other choices a woman in her situation would have. But of course we see the alternate choice in the person of Magdalen’s sister, Norah. Norah accepts her fate. She’s unhappy, but resigned to a new life as a governess. And in the end, her choices are vindicated by the turning of the plot. But even this vindication is not a simple act of Providence. The circumstances that bring it about would never have happened if it weren’t for Magdalen’s wrongdoing. So Magdalen, in a way, is also vindicated. Her wrong makes a right. Although it took a while to get going, this was an absorbing novel that took me places I didn’t expect. Any ideas I might have had about Victorian sensation novels being all about obvious heroes and villains were completely upended. Magdalen, with all her complexity, belongs in that illustrious honor roll of marvelous Collins women. I’m glad to have met her. 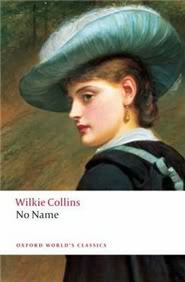 Lots of talk about Wilkie Collins on the blogs these days. You’ve all got me interested in reading another one by him. I’ve only ever read The Woman in White. I tried to read The Moonstone once, but failed to get very far. Once the TBR Triple Dog Dare is over, and I have finished re-reading Our Mutual Friend which I just started yesterday, I just may go for Wilkie Collins. Wait, come to think of it, I may have something on my TBR shelf already….. The Moonstone is probably my least favorite of the four I’ve read, so I’d recommend one of the others. I think The Woman in White is the most engaging throughout, but Armadale and No Name are each terrific in different ways. I hope you find one of those on your shelf! Great review. It’s a long time since I read it, but I remember being gripped by it. Thanks! Once it gets going, it is quite gripping–it’s hard to tell what will come next. This is one of my favourite Collins novels and I agree about the way in which our view of Magdalen is manipulated by the author. I think it is hard for us to really appreciate how the original audience would have responded to this because while we may balk at the way in which she is condemned simply for standing up for herself I suspect the response would have been different in the 1860s. You’re probably right about how our modern view will differ from that the original audience. I do wonder what Collins himself thought of Magdalen’s choices and people’s reactions to her. I’m especially interested in how he sets her up against Wragge, who is a less moral person overall but able to escape the consequences of his actions in a way that Magdalen cannot. Seems like there could be some social commentary there. I’m so glad you liked it! I thought this was wonderful — so many interesting things (as you point out) about motivation and unintended consequences. It’s like the kind of film where you watch it from one person’s perspective and then see the same events from another person’s perspective and realize the first person was all wrong about what was happening. Beautifully pulled off! It’s so clever, particularly when I think about the depiction of Mrs. LeCount. Does she do a single thing that could be considered wrong, outside of being an obstacle to a woman she perceives as a thief? Yet I was rooting against her because I liked Magdalen so much. I did not like this one as much as the other Collins novels. But you had a wonderful write up about it! Thank you! I can’t decide where I’d rank this. I liked it better than The Moonstone, but it and Armadale and The Woman in White were all such great pleasures in such different ways that I can’t choose between them. This was less rollicking fun than the others, but the others don’t raise such interesting questions.